They were tasty and I made a batch in no time...Although I like the made up ones they can be quite time consuming....So for me as a busy mum the cake pop maker came to the rescue...and it had a recipe book inside...fab. 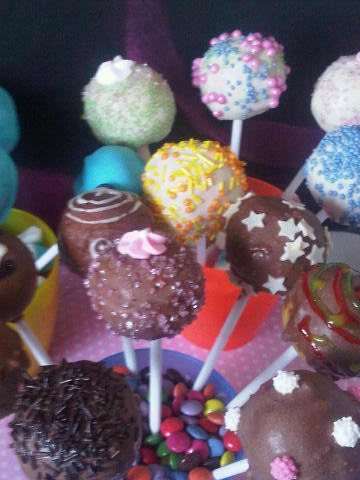 Its up to you how you make your cake pops the best bit has to be decorating and eating them...which can be great fun. Preheat oven gas mark 4...grease a 25cm round cake tin....cream together the butter and sugar add vanilla extract then one egg at a time...mix in half of the flour until combined then the other half of the flour and then the milk. Cream together butter and cream cheese until fluffy then slowly incorporated icing sugar...refrigerate 30 minutes before using. Once cake is cooled crumble cake into very fine cake crumbs...then combine the frosting a little at a time...roughly a tablespoon as you may not need all of the frosting continue to do this until you have a malleable dough...wrap in clingfilm and chill for approx an hour. Then begin to break off small pieces and roll into a small ball...place each ball on a lined baking tray and then chill for a further 15 minutes...once this is done...melt some chocolate dip your stick into the chocolate and then insert it into a ball but not to deep though...allow to set before completely dipping. 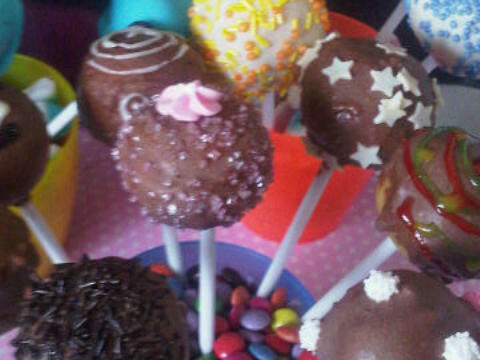 I prefer the old way of melting chocolate.... a bowl over a boiling pan of water......rather the a microwave...but the choice is yours....Melt a large bar of chocolate/or candy melts then gently dip in your cake pop...gently tap the cake pop..or the hand holding the pop to remove excess chocolate whilst slowly rotating to ensure the cake pop if fully covered ....add sprinkles if desired .. then stand into the polystyrene block to dry.....Once dry you may want to decorate with icing pens and cake toppers. ohhh did't realise you can get a cake pop machine! I got one of these for Christmas and haven't even used it yet!! Yours look great, very yum! I could never get over making a cake then smooshing it up to make a pop, hence why someone thought it a good idea to buy me the machine, must try it sometime, maybe for a birthday or kiddies tea party?? I will get it out of the cupboard and give it a try, you have spurred me on! TC birthday in July, plenty of time to practise and taste lots of cake pops! Those are so pretty! I want to try it, sounds fun and the kids would love it. I don't know if I can find the sticks here though. hmmm.